Golden Eagle is relatively new brewery having been around since 2010. I've had the pleasure of sampling their Coal Face Stout which is an excellent brew especially for such a young brewery. I also thought the Solo Lupulus was pretty outstanding too. So with great anticipation I pop the cap. A nice little burst of cascade type aroma hops out of the bottle, well I think its New Zealand cascade, the bottle claims five varieties of Nelson hops but fails to specify any. The aroma is a little grassy and herbaceous. The colour is gorgeous, and amazing burnt orange that made me go "Ooooooo" as I poured it. A lovely little white head completes the picture. Carbonation starts with a little enthusiasm but settles down to moderate in no time. Drinking is easy, its sweet with burnt sugar and toffee notes, a lightness and smoothness to the texture of beer helps it slide down. Theres hints of spice with a punch of hops on the finish. The hops are tangy and citrusy with lemon and mandarin flavours. Nothing too extreme either way and at 5.5% makes for a nice spring evenings drinking. 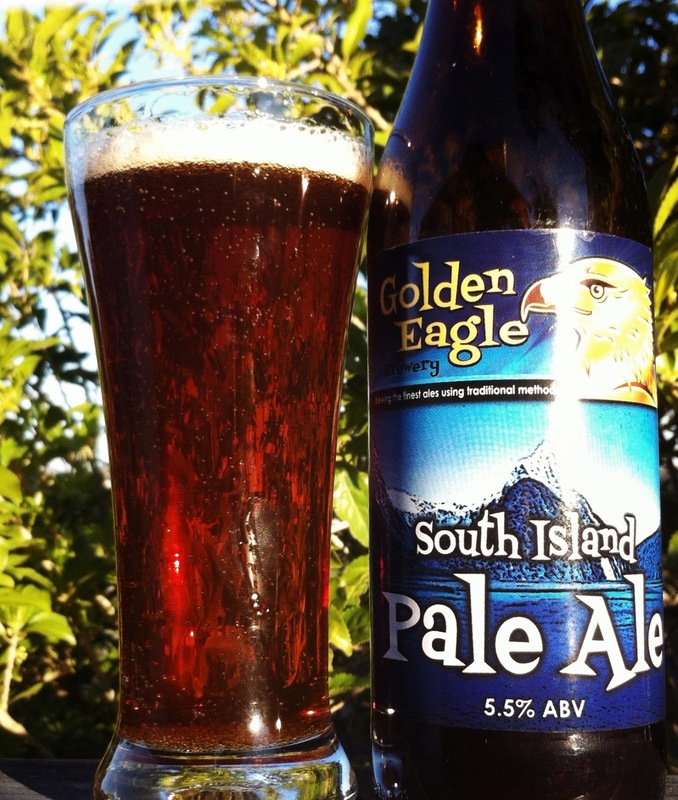 Certainly a excellent addition to the Golden Eagle repertoire.